It’s been a few weeks since my last newsletter but I’m back in full swing! 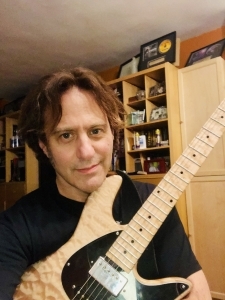 Thursday Feb 7th 8pm VICTOR’S, 500 Commerce St Hawthorne NY I will be with Roger Zee and Rudy Fienauer, bring your axe! Friday Feb 8th 8pm I will be the special guest at STANHOPE HOUSE, 45 Main St Stanhope NJ with The Stanhope House Allstars! Sadly, I sliced my finger and I had to cancel my appearance at Hilltop Tavern but I will be there next Monday to make up for it. 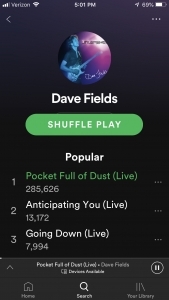 I’m so psyched, my song “Pocket Full of Dust (Live)” from my latest CD UNLEASHED has over 285,000 listens on Spotify! That may not seem like a lot but to an independent artist like me, it’s fantastic to see that people are listening. Thanks for your support! This Friday I return to Tambour 652 5th Ave (at 19th St) Brooklyn NY 9pm for a night of amazing food and drink, blues/rock/soul/jazz! You never know what special guest might show up! http://www.davefields.com/wp-content/uploads/2015/06/davefeatured.jpg 172 499 davefields http://www.davefields.com/wp-content/uploads/2018/06/davefields.jpg davefields2019-01-08 22:25:022019-01-08 22:25:02285,000 Listens on Spotify! This New Years Eve Monday Dec 31st, you can spend it with me at TAMBOUR 652 5th Ave (at 19th St) Brooklyn NY for an amazing NYE experience! Tambour will be serving a four course pre fixe menu for $95. Chef Thomas will “rock your world” with his outrageous cooking! Nick DiFrisco, Joey Lauricella and I will be providing the entertainment and Tambour has the best selection of wine in South Slope Brooklyn. Tonight, Dec 28th, you can have a preview. I will be at Tambour with Nick and Joey! This Thursday 8:30pm Dec 13th I will be at VICTOR’S 500 Commerce St Hawthorne NY with Roger Zee and Rudy Feinauer. Bring your axe! This Friday 9pm Dec 14th I continue my residency at TAMBOUR 652 5th Ave Brooklyn NY with Joey Lauricella and Nick DiFrisco. Chef Thomas has just reinvented the menu to include the most outrageous Italian menu Brooklyn has to offer, and that’s saying a lot! 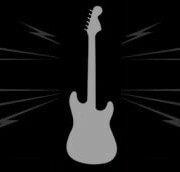 Join us for an evening of Dave Fields brand of blues-soul-rock-jazz! Saturday Dec 15th 7:30pm I perform for the first time at THE BLUE HORSE 247 Raritan Ave Highland Park NJ featuring Buddy Allen and Lee Jeffryes. 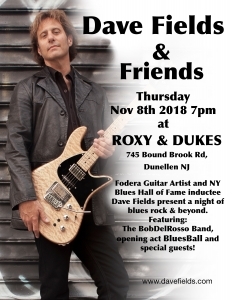 NY Boss Guitar Man and NY Blues Hall of Fame inductee Dave Fields along with Fodera Guitars present a night of Fodera Guitar artists. 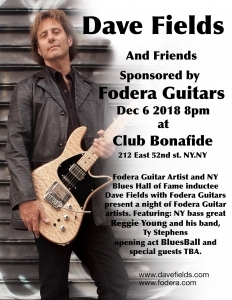 Featuring: NY bass great Reggie Young and his band, opening act Blues Ball and special guest award winning singing sensation Ty Stephens plus more TBA. 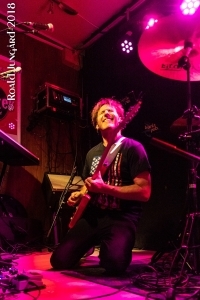 Dave Fields has performed and continues to perform all over the US and the world. 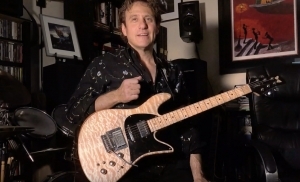 His awards include: Best Self Produced CD 2006 at the IBC for producing BACK IN BLUESVILLE, 2009-2010 Mojo Boogie Award, Big City Blues Magazine Happy To Have The Blues Lifetime Achievement Award. Legendary British bluesman John Mayall recorded Dave’s song “Train To My Heart” on his CD “TOUGH”. Dave’s CD’s TIME’S A WASTIN’, ALL WOUND UP, DETONATION, ALL IN and UNLEASHED have all garnered international success. Grammy award winning, session bassist, and Fodera bass artist Reggie Young and his unorthodox style of bass playing has turned heads in the music industry which unleashed gigs with stars such as Lenny Kravitz, Alicia Keys, Paul Shaffer, Stevie Wonder and many more. Born in New York, Reggie began playing bass at age 12. 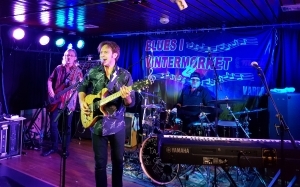 Opening act Bluesball is a Brooklyn NY blues band featuring Jim Ceribello, Joey Lauricella and new members Norm Good on guitar, Lou DiNatale on keyboards, and Thino Cacciolo on drums. Award winning singer/actor Ty Stephens has performed around the world, gaining an international audience with a cool, urban tinged adult contemporary sound, based on jazz, funk and R&B. Dave Fields returns to DADDY JACKS, 181 Bank St New London CT. Featuring Tom DeFaria and Joey Lauricella on bass! I return to Brooklyn NY’s coolest music – wine bar/restaurant with an evening of light blues-funk-soul-jazz with Nick DiFrisco on drums special guest Vlad Barsky on keys and Joey Lauricella on bass. Chef Leo and Chef Thomas will rock your world with his outrageous menu. 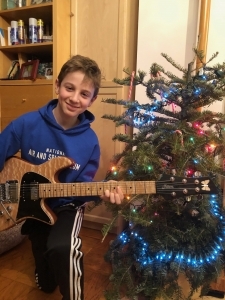 Bring your axe!